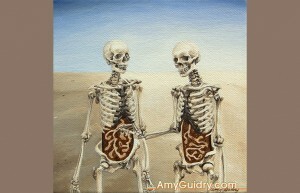 The last available 4″ x 4″ painting in my In Our Veins series has just been sold. Division is an acrylic on canvas and was created around the end of 2012. The buyer had asked about my thoughts behind the piece so I thought I’d share them here as well. ‘Division’ refers to not only the physical separation (humans tend to refer to animals as parts- rump, breast, wing, etc.) but also the divide that we create as far as animals’ worth is concerned. Why is there a divide between animals that we regard as either pets or as food or as working animals? There is even a divide among humans’ beliefs due to religious or moral distinctions. I depict animals throughout the series, and as seen here, as simply heads or limbs to represent the common viewpoint while emphasizing their importance through their expressions or their eyes, for instance, illustrating that they are indeed sentient beings. I recently attended the launch party for the Spring issue of L Magazine. I am featured on page 16 in an interview by Patricia Gannon titled “The Art of Business and the Business of Art.” In attendance at the party were former Governor of Louisiana, Edwin Edwards and his wife, Trina (also featured in the magazine). If you live in the Lafayette area, you can pick up a copy for free at newsstands and shops around town. You may recall awhile back I posted some exciting news that my painting Wisdom was loaned for the upcoming movie “When Angels Sing.” They’ve recently released a trailer for the film and it is set to come out this Fall! It had a special premiere recently at the SXSW festival last week. The movie stars Harry Connick, Jr., Lyle Lovett, Willie Nelson, and Connie Britton, just to name a few. I received some great news the other day. 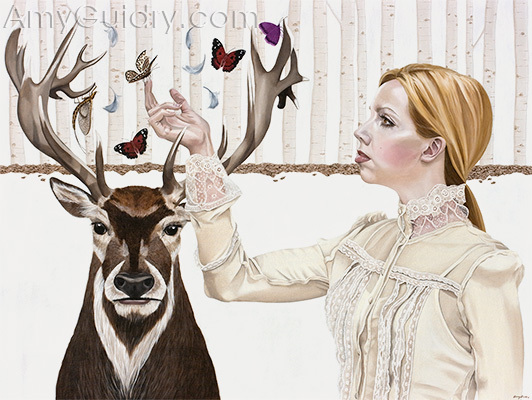 My painting The Pack recently received a Juror’s Award in the Peaceable Kingdom: Animals, Real or Imagined exhibit at the Bedford Gallery in Walnut Creek, California. My work was selected by guest jurors Stephanie Cannizzo, Assistant Curator of the Berkeley Art Museum and Cathy Kimball, Executive Director and Chief Curator of the San Jose Institute of Contemporary Art. If you are or will be in the San Francisco area, you can view the exhibit now through May 19. My painting Systems from the In Our Veins series has recently found a new home. It is an acrylic on canvas, 6″ x 6.” I had posted a progress shot of this piece awhile back showing where I had left off with it. I put this one on hiatus for over 2 years before revisiting it and finally completing it. Sometimes it just takes a step back to suddenly see everything clearly. View the finished painting online here: www.amyguidry.com/systems.html. I recently became the proud owner of one of local artist Donald LeBlanc’s totems. 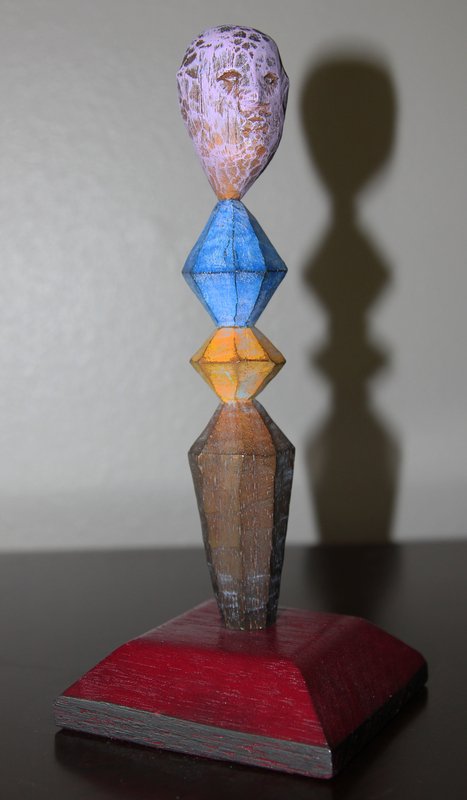 It’s from a collection of wooden totems he produced- I believe this one is #4 (?) from 2010. Needless to say, I love the piece. While in the gallery, I did not immediately know where I was going to put it, but I knew I’d find a spot. Keep in mind my home is currently in transition and many rooms have yet to be painted. I quickly discovered that I had many possibilities for this sculpture. With five colors in it, I found that either one or several colors were a perfect or close enough match to existing colors elsewhere in the decor. The fact that it is wooden also works with an existing collection of wooden folk art objects that I own. Even the size allows for many possibilities because it’s roughly 7 inches tall (just guessing off the top of my head). Not to mention that once all the walls are painted to more neutral and muted colors, it will allow for even more options. After moving the piece to various locations, I finally settled on the bedroom. It just so happens that my accent wall is similar enough to the base of the piece that it works. I titled this post ‘serendipity,’ but really, when it comes down to it, there is no accidental good fortune involved. We are visual creatures. We respond in different ways to various colors or patterns and will gravitate to particular ones. Take a look in your closet or in your home and you will find that there are certain textures, colors, and/or patterns that tend to repeat themselves. Which is why when you are drawn to a particular work of art, what attracts you to it is probably the same thing that attracts you to other aspects of your life. So the real question is not whether a work of art matches your sofa, but whether or not it matches your life and desires. Does it evoke the feelings you wish to have when you walk in that room? Does it bring you joy? Maybe it reminds you of a pleasant memory. That sofa you have may be comfortable, but it doesn’t carry the emotional weight of a work of art. And eventually your sofa will need to be replaced- that work of art will be in your home and that of future generations forever. Don’t worry about whether it matches. It will. If a work of art speaks to you, you can’t possibly ignore it. It was meant to be. My latest painting in the In Our Veins series is now online. It’s also found a new home already. 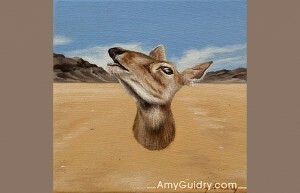 The title is Reciprocity and it is an acrylic on canvas, 4″ x 4.” I just recently featured it in my March newsletter. 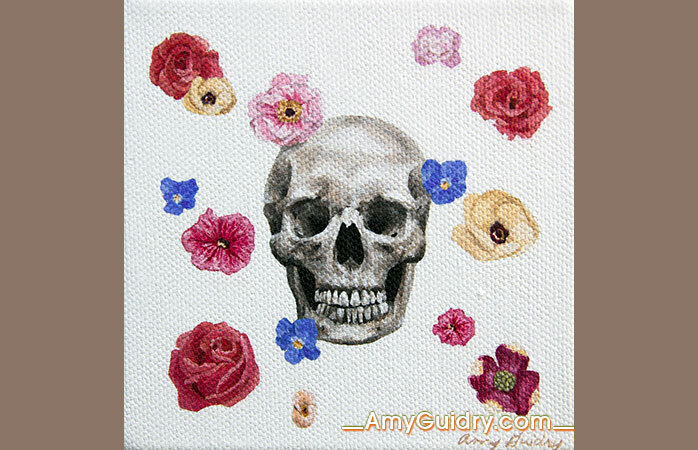 If you would like to be in the know about new work, sign up for my monthly newsletter here: www.amyguidry.com/contact.html. View Reciprocity online here: www.amyguidry.com/reciprocity.html. My work was recently featured on IPaintMyMind. Editor Evan La Ruffa writes, “Regardless of the ethos, which isn’t always as obvious as some onlookers hope for, we find Amy’s work pushes the boundaries of logic in various valuable directions. Art should provoke, and she certainly does.” Read the full review here: http://ipaintmymind.org/art/amy-guidry/.